Democratic Party President Harry Kalaba says the time is coming when he will present evidence on the corruption allegations he is making against President Edgar Lungu. Mr. Kalaba says it will be difficult for him to present evidence now because the Law Enforcement Agencies will not act on it. Reacting to President Edgar Lungu’s challenge for him to present the evidence to the Anti-Corruption Commission for investigations on the corruption allegations he is making, Mr. Kalaba said law enforcement agencies are being intimidated by President Lungu and his government for doing the right thing. Mr. Kalaba has asked President Lungu to be patient with him saying the evidence will be presented at the time he does not expect and no one will defend him. “Everyone knows, Jets are being procured, someone is getting money from oil being procured for this country, all that evidence is coming at the right time”, said Mr. Kalaba. He said he will not fall prey to the politics being played by President Edgar Lungu which is not adding any value to the lives of the Zambian people. Meanwhile Mr. Kalaba has challenged President Lungu to tell the nation why he fired Emerine Kabanshi as Minister of Community Development and Social Welfare if it was not for corruption. President Lungu has challenged Mr. Kalaba to go to the anti corruption and report the acts of corruption that he claims he saw in the ruling Patriotic Front Government. The President said that Mr. Kalaba should not use the issue of imaginary corruption to tarnish the image of the Party when everyone knows that he resigned from his position as Foreign Affairs Minister so that he could start pushing his Presidential ambitions. The President said that as Foreign Affairs Minister, Mr Kalaba was always with him on his trips abroad and if he had seen any corruption taking place, he could easily have brought it to his attention, but never had he at any single moment said anything about it to him. Why wait … do it now. It’s against the law to withhold evidence in any litigative matter. ACC would be interested even though that office has immunity. You don’t want a Mike Cohen on you otherwise you will be treated as an accomplice to the crimes. The smart people of the Zambian Enterprise need to know the truth about your alleged corruption if it at all exists. You allege, you prove … otherwise sit down and focus on your presidential ambitions which are within your rights to pursue. Do it now … let’s roll. Whatever may be said about Harry Kalaba, he clearly operates at a different level from ba Lungu. He has decency, respectability, and is well measured. You can see the gulf in thinking by reading his statements and reading The President’s statements. The guy speaks more like a leader. Bambi ni ba kaponya mu ma suite! Kalaba comes across as a bit naive if you have evidence and will produce it at a later date then just say you dont have it and just allude to various corrupt procurement under Lazy Lungu. Mind you Lazy Lungu is surrounded by street thugs who were nobodies before PF…they will stop at nothing to cling on..you will simply end up like Mike Mulongoti in a RSA all paid for by Lazy Lungu and the crook Mwamba watching over you 24/7. A wise man knows the right time to strike, the right to speak. The fool blurts out folly and thinks himself wise. Kalaba was willing to resign from being A minister on principle. You have to respect that, even if you are a hard-core brain dead cadre. The only other person I can think of who resigned on principle was Mwanawasa. And he has arguably been the best president we have had. We are yet to see what Kalaba is made of. But you have to respect his principled conduct. Unfortunately we never vote for principled people in Zambia. We want the Lungus the RBs the FTJs of this world. @Jay Jay do you have any evidence that PF syndicate are killing Mulongoti softly? Between Lungu and Kalaba, I believe Kalaba. Politics is like a poker game – you do not show your hand until the time is right. And even if Kalaba went to the ACC, what action can this toothless organisation do? I now fear for Kalaba’s life. I hope he keeps his cards close to his chest. HK is a coward. I hate cowards and their cowardice behavior. Why wait? True why waste time when we all know chitotela, the chanda mafia’s and AVIC kickbacks. Mr. Kalaba, even when you have solid and incriminating evidence , it’s folly and dangerous for you to let your very powerful enemy know what you have up your sleeves against them and to tell them that you will expose them at an “appropriate time”. I hope you have adequate security. I fear for you. Politics is brutal in Zambia. Do not throw mud at anyone yet Mr. Kalaba. Yes mud does stick, but by 2021, it will have washed off. Nichamwenso umwaiche Kalaba!! Be like umwaiche munobe CK…! I actually respect Kalaba over Lungu. Jets being bought, fire tenders, why is ZAF dropping maize in luanshya at the time of bye elections? Democracy at its best or ist at its worst. It does condone biasness. It is party of it. If I am biased towards Harry, what ever he says will be at different level because he occupies a space in my faculty. That is what is happening now in Zambia and everwhere else. The only fact that tears down this biasness is objectivity and facts that are advanced in each case. Kalaba tell us when we are still all alive for we don’nt know the length of our life. Kalaba be careful mudala, these people will kill you, we all know what happened to Paul Tembo, they killed him before he could submit the evidence to parliament. So mudala just keep Quiet until the time is right otherwise don’t. Not Lungu my friend. With all the insults floating around against Lungu we could have been picking dead bodies everyday was it under a certain president. Lungu is too drunk to kill anyone, true. But the PF cardres can harm you irreparably – they do this for a living. It is their day job. Some even have honourary Doctorate degrees in “pain infliction”. “President Lungu said as Foreign Affairs Minister, Kalaba was always with me on trips abroad and IF Kalaba had seen any corruption, he could easily have brought it to my attention or to the attention of the Zambian Watchdog”. WHAT WAS MAMBALA WAITING FOR? But you have to give credit to Kalaba, to resign from a prestigious position such as Minister of Foreign Affairs with all its perks takes someone with a lot of integrity. There are PF MPs that are frustrated at not being appointed iwe you resign. Let Mr Kalaba say it now if he has evidence. The law enforcement agencies may protect the President now but the people of Zambia will have known the truth and will act decisively. If Kalaba can’t say it now, then nobody is supposed to take him serious. Let us not say things on which we cannot substantiate. Mr Kalaba should not take the people of Zambia for a ride. Zambians are too docile and timid …only a fooooool will rely on them…look at Chifire it had to take Lazy Lungu to pardon him! Yes why he wait. Maybe just like Kambwili he doesn’t have anything on anyone but just fishing in a dry pond. Kalaba is right. Lungu is now literally controlling the ACC and has immunity from prosecution.The ACC is useless under Lungu. Kalaba knows what he is doing. ECL and his PF have a dreadful and bleak future ,although they may temporarily now enjoy their folly. Yes,we have politics of personalities trending in Zambia because personality,morality,character,virtue and conscience are the biggest deficiencies in our current Zambian leaders and not ideology. The developmental agenda and economic challenges facing this country are straightforward for any leader who is not committed to corruption.Let the people discuss personalities in leadership conclusively and learn to choose good leaders. @mitimiti, we will not wait for an upright leader because he might not come. KK was accused of stealing $4BN, FTJ had even his personal shoes confiscated, LPM died in office but there were whispers about his conduct in emerald deals and the Chinese, you know about Rupiah, HH stands accused even before he’s been in office. All these stem from a our system of having a very strong President. Luduig Sondashi had proposed a federal system that could have devolved power to provinces and I agree with him. We can have a system that revolves around 1 individual. Let Cabinet be appointed from outside Parley, let’s effect the concept of real regional govts you’ll how things will change. Less deals will be cut at Plot 1. Even clowns want to be near the President, why? Kalaba, why present evidence at a later stage? It could only mean that you will only do it to those that will be on your side. Thats corruption, as these will only act under your instructions. 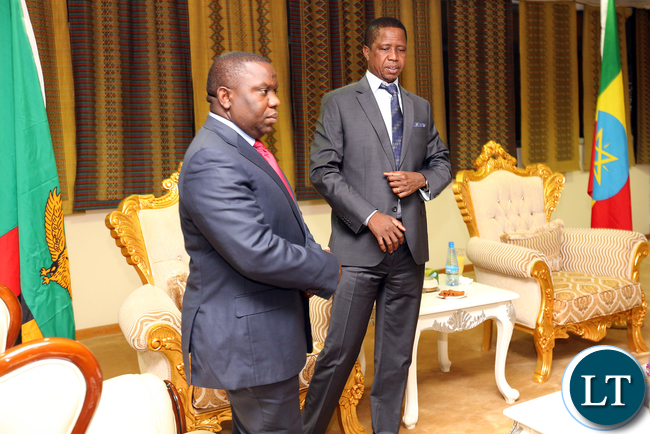 What will the difference with E C Lungu? Then you and Edgar Lungu are the same. Just tell us that you didnt your share, from Lungu. Thats all. Harry time is now. Tomorrow doesn’t belong to you. Present your evidence even if it’s not acted on, it will be on record and future government can act on it. You mean you’re prepared to wait until after 2026 should Edgar win 2021? You are simply bluffing. You can die tomorrow or after 2026 so don’t play cheap games. Harry Kalaba has no evidence about corruption in PF.Harry Kalaba resigned after noticing that ECL will be standing again on PF in 2021.Kalaba and Kambwili really wanted PF to adopt them as presidential candidate.This is the danger HH is playing with now because Kambwili has openly stated that he wont accept anything less than being a presidential candidate in 2021.HARRY KALABA NEVER SAW ANY CORRUPTION IN PF BUT SIMPLY WANTED TO BE PF PRESIDENT! !Its a pity that many Zambians are easily fo0led.ECL is daring Harry Kalaba to expose corruption in PF now,SO WHY WAIT? Harry Kalaba should just shup it up because he is just a liar!! When the Post newspaper failed to install Mr Magande as successor to Levy Mwanawasa, they resorted to all tactics. They ended up settling for Michael Sata who was until then their sworn enemy. They sent some female reporter called Chansa Kabwela to some place claiming it was the UTH where she took photos of a woman giving birth on the floor. All this was just to finish off Rupiah Banda. When Sata won the election this woman was rewarded with a diplomatic position, I think in Malawi. Mwalitemwafye amatalisho. Mothers used to deliver on the floor at UTH, there is even no point arguing about it. Unless you were born just last week, you should remember UTH used to be called ‘departure lounge’. Some of us used to work there. The reason Chansa Kabwela’s pictures made it look like a POST political stunt was because the government would not have allowed her to take any pictures in UTH. Even now, you yourself as PF cadre, just go to UTH with your camera and see if you will come back alive. At least speak the truth. Don’t you people find it tiring living in lies all the time?? I’m not political, not opposition. I’m just a citizen concerned about the way you ruling party cadres like twisting history to cover yourselves. So it’s the UTH started collapsing under the MMD? I love your answer because you have cleared the air. Rupiah had been president just for a few months so how could he certainly have destroyed the UTH in such a short space of time. Hope you know what I am leading to. How utterly ungrateful and treacherous human beings can be for personal gain. God never rewards treachery, the 30 pieces of silver is all that is paid as a wage. So you are just good at speculating, you have no balls Kalaba. Expose ECL now, typical of useless cowards. If you can’t expose him now then just shut up, so you see it fit for ECL to continue with corruption as you put ? Even if he brought evidence stating that ZAF used a proxy company owned by Tasila to procure those Jets….Amos rubbishes it you think anything can happen. The sitting president in Zambia is too powerful especially a corrupt empty tin like Lazy Lungu who is surrounded by Grade 9s thugs as advisers!! KALABA – You are right. Don’t share your evidence. It will vanish and then the ruling regime will come after you. But if I were you, I would not talk too much. Don’t give any hints. Otherwise these guys might decide to get rid of you, as a way of getting rid of the evidence. The nation will need that evidence in future, even if it means waiting till 2060. Bottom-line: the chickens always come to roost. Some former presidents who stole millions still ended up dying in poverty. God has His special ways, He shall redeem Zambia. We have seen it before. So those that keep singing “ECL Beyond 2021”, that is fine – except he won’t be on that seat forever. And from experience, either the thief or his family end up paying back, one way or another. What you are saying doesn’t make sense at all. They say strike while the iron is hot. How is hiding evidence going to help anyone. What surprises me is that you the same people used to accuse Kalaba of a lot of things especially on the numerous presidential foreign trips. Because of your instability, Zambia may one end up with a mad person at state house. Kalaba is right with all the evidences available nothing is happening so far.Chitotela was caught pants down but he is still enjoying Government facilities and services as an accused minister and the President is watching.Truly, let us wait for the right time and that time is not in heaven. Interesting to read all the comments about Harry Kalaba and H.E ECL. Life and Time are the world’s best teachers. Life teaches us the value of time and time teaches us the value of life. This gives me comfort. Time and/or Life will vindicate Zambia. Those that are clean or not clean, only a matter of time and/or life! The bible is clear: You will know them by their fruits! I will be watching from the terrace as The Observer, armed with a big camera to capture every bit when that time comes!! You started okay until you mentioned that fiction of a book!! Okay Hon Kalaba, just make sure that you have no skeletons in that cupboard. And also ensure that you are not guilty of being an accomplice to corruption the time you served with alleged corrupt people. Don’t dance the tune of trib.als …. kikikikiki …someone will be offended …… but trib.al Gay Jay is now used to me and can no longer hide his other face as trib.al Hacks. ….. anybody offended? Trib.als are a reality in Zambia simce 2006 so don’t pretend. Good Kalaba, don’t. Wait for the right time. All courts, police, etc can’t act now. I 100% agree with you. Zambian politicians are like magicians. They like riding on the cocktail of illusion. Didn’t we go through this with one Senor’ Kambwili? We all know that corruption has existed in Zambia from the time of UNIP and KK. That is the period we as Zambians allowed corruption to permanently plant itself. What is corruption then? In general, corruption is a form of dishonesty or criminal activity undertaken by a person or organization entrusted with a position of authority, often to acquire illicit benefit. Corruption may include many activities including bribery and embezzlement, though it may also involve practices that are legal in many countries. Political corruption occurs when an office-holder or other governmental employee acts in an official capacity for personal gain. Corruption most common place is in kleptocracies, oligarchies, narco-states and mafia states. As for Kalaba I have just got one question? When did you notice the corruption in the PF Government? Was it the day you decided to resign or before? Ask why do you even care to make the allegations? This is a silky response and shows Kalaba is as pedestrian as his fellow opposition pundits. It’s disappointing and I’ve had to knock off a few points from him on my popularity political pin the donkey tail chart. If you care about corruption in office you step up with the evidence and let the law act, don’t make allegation. Anyway he shows little trust in ACC as most citizens, in their ability to handle the corruption allegations! It’s just a simple case of a hand bragging over the leg wanting to be the Brain!real men simply quit politics..especially if directly or indirectly you are a beneficiary of what you are condemning. .